These used to be traders. No one wanted them. 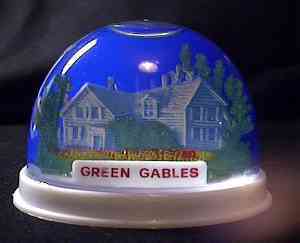 Green Cables is where Ann Shirley lived on Prince Edward Island. (PEI) It's also the name of her book that must be more widely read in Japan than the USA. When we visited, a busload of tourists from Japan unloaded. A long ferry crossing was needed to reach the island. Instead of traffic jams, it was a ferry jam. Hundreds of cars backed up by the dock waiting for the boats when we left PEI. Now clever engineers have built a highway bridge. That's kind of sad. PEI will be overrun by fudge and burger shops soon. 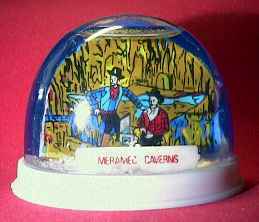 Legends say Frank and Jesse James used Meramec Caverns as a hideout, but legends say they hid in every small town in Missouri. In any case, they wouldn't recognize their old cave these days. Outside is a really bad bronzelike statue of the outlaw brothers. Inside, two mannequins depict the two brothers by a underground pool, which presumably has a tunnel to the treasure room. Hah! It's a good old fashioned cave tour though, ending in a cavern shaped like a concert hall a Kate Smith recording sings God Bless America while colored lights flash off the rocks. A kind of tacky patriotism that sends chills up the spine. In the late 19th century, many wealthy Chicagoans would travel by train 50 miles north to this resort area in Wisconsin. P.K. Wrigley, who made his money in chewing gum, had one of the biggest estates on the lake. 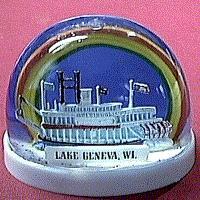 Today, us common folks drive up to Lake Geneva and take the paddleboat ride depicted in this snowdome to see his old digs. Visit the area in winter. The parking situation, which is awful in the summer, is simple. We just parked on the lake as the ice was twofoot thick. Instead of paddle boats, we had ice fishermen.